One look at the ingredient label on your favorite beauty product and you’ll no doubt see a long list of chemicals with names that are nearly impossible to pronounce. No wonder women today face a myriad of skin problems - these ingredients can’t be good for anyone’s skin. Fortunately there are natural alternatives for every beauty product, some you can even make yourself at home. 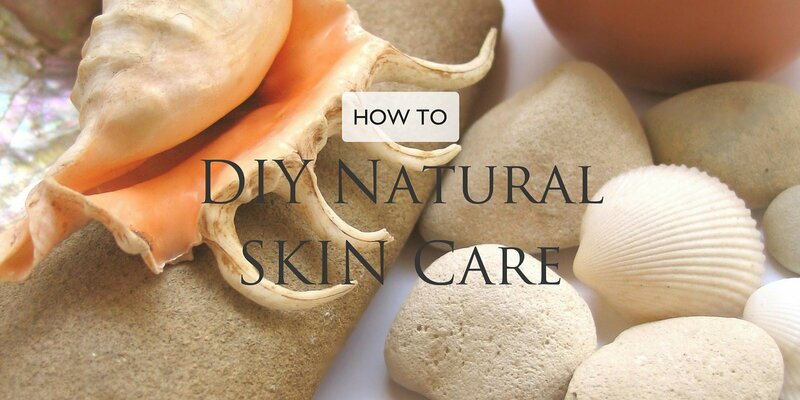 Read on for the top DIY natural skin care tips. Coconut oil has to be the best-kept secret among natural beauty experts for both skin and hair. Apply a few drops of coconut oil to your hands, cheeks, arms and legs to add a quick glow and moisturize skin. Use coconut oil as a natural replacement for shaving cream. Coconut oil can also be used on your hair - use melted coconut oil as a deep conditioning hair and scalp treatment. Massage coconut oil into your scalp and then work it through your hair, leave it on for a couple of hours, then wash it out using shampoo. If you don’t want to use pure coconut oil on your skin or hair, look for products that contain only natural ingredients (i.e. coconut oil) like Pure Fiji’s coconut milk shower gel or coconut creme shampoo and conditioner. It may seem obvious but drinking at least 8oz of water everyday is important for both your skin and your overall well-being. Water keeps your skin hydrated and prevents it from getting dull and dry. Also try to eat plenty of vegetables and fruits with a high water content such as watermelon, cucumbers, grapefruit and strawberries. Use a sugar scrub to exfoliate skin and keep it looking smooth. Mix 1 tbsp sugar with 1 tbsp coconut oil, apply to skin and rinse with warm water after 15 minutes. If you don’t have time to make your own sugar scrub, try one made with all natural ingredients like Pure Fiji’s coconut sugar rub. This natural body polishing treatment combines raw sugar cane with cold pressed virgin coconut, dilo, macadamia, and sikeci nut oils. Just like you should always brush your teeth before bed, always remove your makeup before bed too. Skin needs to breathe over night and can’t do so if your makeup is still on. Leaving your makeup on overnight clogs pores, which can then lead to blemishes and/or blackheads. Use a cleanser, like Pure Fiji’s purifying cleanser, which is made with hydrolyzed soy protein, papaya and passionflower extracts for a gentle clean. Your skin suffers when you don’t get enough sleep as it becomes tired and dull. Try sleeping on a satin pillow, it will prevent hair damage and breakage and keep your skin looking youthful and healthy. For a quick and natural facial, try giving yourself a honey mask. Raw honey is naturally anti-bacterial and a great way to get super soft, beautiful skin. Once a week or so use a tablespoon of raw honey and gently warm it by rubbing your fingertips together. Spread the honey on your face and leave on for 5-10 minutes. Use warm water to rinse it off and pat dry. To help reduce product buildup in your hair, try using apple cider vinegar as a clarifying shampoo once a week. Mix ¼ cup organic apple cider vinegar with 1 cup water. Apply to your hair, making sure to focus mostly on your roots. Rinse well and follow with your favorite natural conditioner. And remember, the best all natural beauty tips are not all quick fixes. Real beauty comes as a result of taking care of yourself and your body on a daily basis. Invest your time in the natural skincare tips above and be sure to treat yourself to some great natural beauty products today!